If you were in Wildwood, Florida, this past weekend for 75 Chrome Shop’s annual truck show, you wouldn’t have been able to miss this Ausome® “One of Many” truck. One of our readers sent us the video below, which clearly shows the truck’s many custom-built items depicting the popular Autism puzzle pieces. 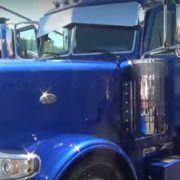 This beautiful big rig has been spreading Autism Awareness every time it hits the road. The truck is the brainchild of Mike Manuel of Michael A. Manuel Trucking in Front Royal, Virginia. Mike enjoys building show trucks, and this, his fourth one, was inspired by his daughter, Kara. The idea of a truck dedicated to autism awareness came to Mike a few years ago, and he began talking to companies and gathering sponsorships while attending various shows. When the truck was ready to be built, Manuel Trucking still had sponsorships available and Brandon Key of Rush Peterbilt, jumped onboard. His daughter, Maggie, also has autism, and he and Mike shared stories about their daughters as the truck was taking shape. The names of both girls are on the truck, along with the various logos and names of the people and businesses that helped make the truck become a reality. While there is no set schedule for the One of Many truck, it did make a recent visit to a middle school in Winchester, Virginia, where 20 of the students are on the autism spectrum. It also appeared in the parade around Bristol Speedway before the Fitzgerald Glider Kits 300 race on April 16. The next big show you can see the truck is at Fitzgerald Glider Kits in Crossville, Tennessee, in July. Honk if you’re a fan. We know we are.